Unpopularity ratings for Donald Trump and Hillary Clinton are at historic levels among all voters — but especially among millennials. "The millennials are one of the most elusive media targets on the planet," said Geoffrey Klapisch, a marketing consultant and professor at Emerson College. “Couple that with either apathy or message resentment. Both candidates have two strikes against them and have to work extra hard not just to reach them, but to influence them." 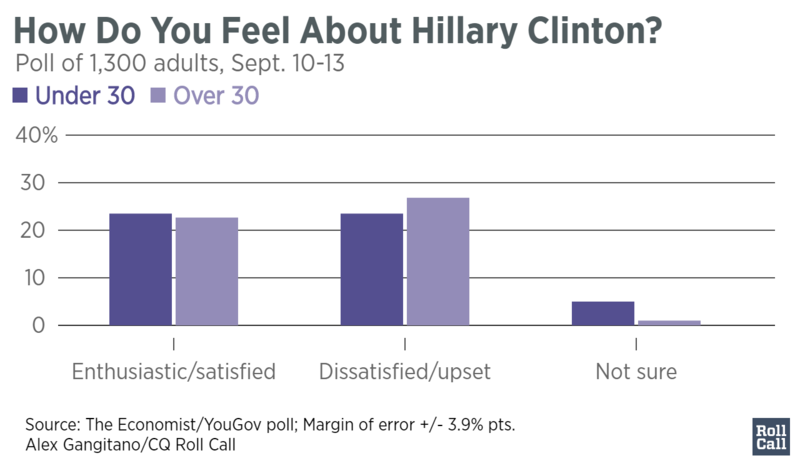 Voters in general aren&apos;t enthusiastic about either presidential candidate, according to the most recent Economist/YouGov poll. 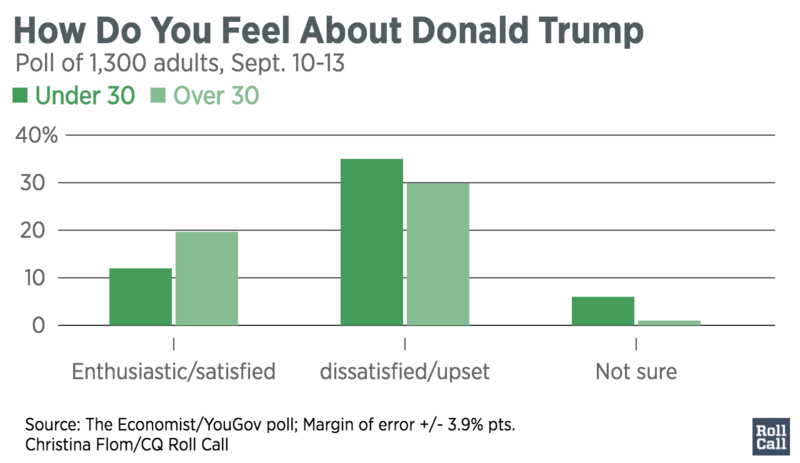 Fewer than one out of four voters under 30 were enthusiastic about Clinton, and slightly more than one out of every 10 were enthusiastic about Trump. Both sides are trying to get the kind of voter response that Obama did in 2008 with more modern tools. But neither has the president&apos;s appeal. Sen. Bernie Sanders in 2016 and Obama in 2008 were "sort of these inspirational, transformative, outsider candidates, who really could embrace this idea of change and hopefulness and coming from the outside and not from conventional politics,” said Daniel Kreiss, a journalism professor at the University of North Carolina at Chapel Hill. Kreiss specializes in the study of technology and politics. During the Democratic primaries, Sanders drew support from an overwhelming number of millennials. After losing his bid for the presidency, that energy from younger voters didn&apos;t transfer to Clinton. Trump&apos;s problem seems to be his controversial messaging on social media that often is not in step with the messaging of the Republican establishment. Kreiss said that so far, he hasn&apos;t seen much evidence that Trump is "engaging anyone, to be frank." The Trump campaign did not respond to multiple requests to discuss its outreach to younger voters. But the Republican National Committee said they carefully assessed what the Obama campaign previously did in terms of attracting young people and is employing some of the same tactics: organizing in the grass roots and hiring young people to speak to their peers. The Democrats ramped up efforts this summer to engage and mobilize younger voters, said Christopher Huntley, the Clinton campaign&apos;s director of millennial media. By early July, the campaign&apos;s engagement team was in full force. Both campaigns say the first step is to actually get millennials to register to vote. The RNC launched the Republican Leadership Initiative, a six- to eight-week program in which volunteers across the country learn how to organize young voters. After they&apos;re trained, they go to high school and college campuses to talk to their peers. “It really helped us tap into this whole new group that we never had interaction or a relationship with before,” said an RNC official who requested anonymity. The Clinton campaign also has surrogates on the road to discuss what issues resonate with millennials. Much of the focus is on Clinton’s debt-free college plan. This summer, a Clinton campaign program worked to register and commit more than three million voters and ensure that millennials are registered or re-registered for November. So, what tools are Republicans and Democrats using to connect with young voters? Both sides have had to learn how to Snapchat. With Snapchat, "users expect immediacy, authenticity, the personal side of candidates,” he said. The Clinton campaign has invested in a digital media strategy for everything from Snapchat, Twitter and Facebook to Instagram, Quora and LinkedIn, Huntley said. “We, of course, believe it’s important to go where millennial voters are, and [we] know a lot of them get their news online,” he said. He added that Trump’s use of Twitter produces nothing but good outcomes for Democrats. Young voters, he said, are turned off by the GOP nominee&apos;s tweets. “Donald Trump has one heck of a Twitter feed, but he uses it to bully and belittle people — and look how young people are responding, opposing Trump in record numbers,” Huntley said. The RNC finds that the Republican Leadership Initiative&apos;s YouTube videos produce instant success. “We get comments on YouTube videos, comments on Instagram, Facebook posts. ‘Oh, what is this? I would love to organize my community. How can I learn more?’” the RNC official said. In the past, he said, millennials may have thought that a lot of Republican campaigns were talking at them instead of to them. "They weren’t listening to them enough. I think, literally, we listen on social media platforms, we’re following what the conversation is and when they engage, we engage with them,” he said. So, who’s engaging millennials better? Trump does get his message out on his own personal Twitter page, Klapisch said, but that&apos;s been criticized for frequently taking the campaign off message. After laying the groundwork during the summer, the campaigns will now see if their efforts pay off. Younger voters traditionally begin to pay more attention in the last two months before Election Day. Klapisch said that there will be a shift in millennial focus gearing up toward the debates. “That’s when the media and the integrated messaging team is really all hands on deck,” he said. "[Millennials] may lag in ramping up” but they&apos;ll be focused by the first debate. Both parties are nothing short of confident that millennials eventually will be attracted to them. Huntley said the Clinton campaign is hoping to register and turn out as many millennial voters as possible. He sees Clinton&apos;s message as positive. And Trump, he said, represents "everything they oppose." "We like our chances," Huntley said.